Most of one week down since the purchase, and so far the score is a resounding Sims 1, Ysharros & household 0 — and that includes a couple of false starts, like the DVD not running in my machine’s drive. For once it’s not the DVD’s fault: my drive is almost 9 years old and, to put it kindly, is somewhat temperamental as to what discs it is actually willing to read these days. However, it plays just fine on Mort’s machine. I was expecting to be interested for a while and entertained for a day or two. I was also expecting to find that the whole Sims experience became too much like a micro-managing chore after a while, which is how Sim City usually ended up being for me. Part of that is my fault — I have some control-freak tendencies — but part of that is the nature of any game with a zillion different pieces and things going on, any one of which could foul things up big time if you don’t keep a constant eye on them. Admittedly, this is getting better as the underlying AI of these sim games improves. Anyway, I expected The Sims 3 to be more of the same except I’d be dealing with people instead of housing zones or transportation networks. Wrong! Yes, the Sims 3 is engrossing. Yes, it’s much more complex and broad and layered than I expected. And yes, it’s rather addictive. There’s been a little micro-management but that’s really only because we wanted to: one can give one’s various Sims a greater or lesser degree of personal decision-making freedom and if you’re not telling them what to do, they’ll decide for themselves. 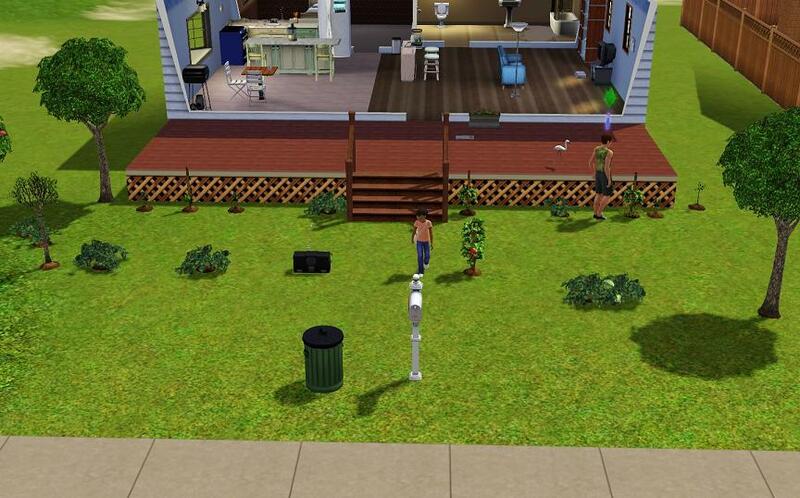 As has been reported elsewhere, there are lots of things to do in the Sims and one of them is finding seeds which you can then plant and tend. What hasn’t been reported elsewhere is how insanely addictive some of these mini-games can become. Anyway, the first thing we did with Herb was spend most of his money on a pretty seaside lot and a decent sized but mostly-empty house on said lot. Such furnishings as we could afford by the time the house was built were definitely substandard, but Herb figured he could upgrade those as he went. After that the first “real” thing Herb did was to attend a grilling contest down at the local beach social spot, which happened to be on the very afternoon he arrived in town. All he knew how to make were hotdogs, but what heavenly hotdogs they were! He won, of course, and his culinary career began. A night or two later, right after we’d bought a couple more things for Herb’s house, he was burgled! (And after saying “That never happened to Calliope!” about a million times, I realised how handy my solo-Sim’s “lucky” trait must be.) Fortunately, he called the police at the first stealthy creaks on the porch outside and the evil criminal was not only apprehended, but relieved of our phat lewt, which was eventually returned to us. Getting robbed wasn’t fun for Herb, but watching the neighbours come over to rubberneck and say nasty things to the thief was amusing for us players. The sheer quantity of “little things” in this game is amazing — people sneeze, burp, watch other people get up to stuff, gossip, say the wrong thing, or scratch themselves when they think no-one is looking. Brilliant stuff; I can’t wait to have a better computer so we can run this game at a higher rez more smoothly. 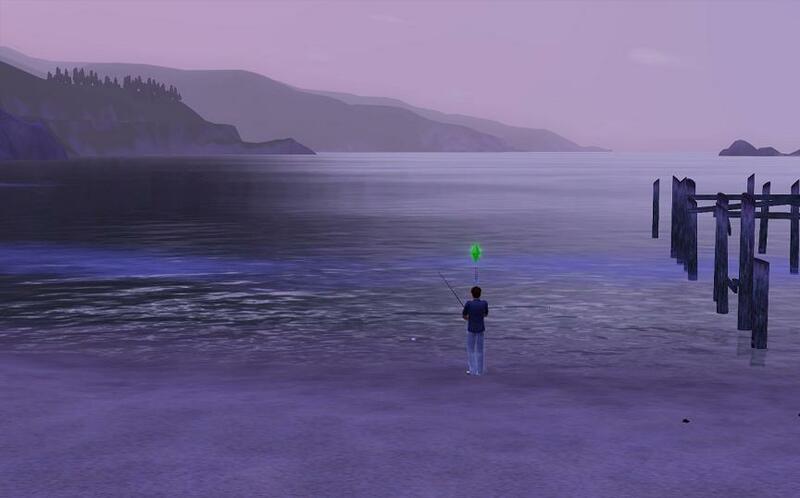 Having had our night’s sleep so rudely interrupted (and sleep matters a lot in this game), we decided to go fishing. We didn’t catch much, but it sure was restful. The job we got at the local bistro wore Herb out for a while, until we realised that in some jobs, you can take it easy and actually do well! We also found out how important it can be to schmooze with your co-workers — especially after you get a big, fat promotion and raise and they don’t. They didn’t like Herb much there for a while. As it turned out, the job was almost like a vacation. By then, we had discovered gardening. Man, it takes a lot of time, even when one has a green thumb. It’s easy to let it get out of hand, especially if you’re a perfectionist like Herb (which means most activities take him longer, though he ends up doing them better than most other people) and especially if you’re a pack-rat like the players playing Herb. Juggling the needs of the ever-increasing garden with the need to not show up stinky to work and the need to actually show up at work and get promoted… yikes. Herb doesn’t have time for much of a social life, that’s for sure. However, he’s poised on level 9 of 10 of his culinary career — he’s already an Executive Chef and he hasn’t even hit his 30s yet. He is, however, pretty close to burnout most of the time — he gets to sleep as soon as the work shift is over, usually around 9 or 10 in the evening, and he’s up before 5, ready to tend the plants and harvest the produce. My first Sim-character was Calliope, a friendly, bookwormish artistic writer type who was almost too much like an idealised version of myself — comfortable to play, but not exactly full of surprises or challenges. In contrast, Herb is an ambition-ridden perfectionist who gets antsy when he hasn’t been promoted or received a raise in a while, who takes his time getting everything juuuuust right, and who really doesn’t care who he talks to as long as it gets him where he wants to be in life. He’s predisposed to being friendly, but that tends to take second place to the needs of the job and the garden — and since the gardening feeds almost directly into his job as a chef (pardon the pun), those two activities tend to rule most of his life. His only close friend is his boss, which is pretty sad. On the upside, he only works 3 days a week now and he’s hauling in over 1,000 simoleons a day. Maybe he’s finally reached that stage in his life where he can finally stop being so driven at work and start smelling (instead of mulching) the roses. 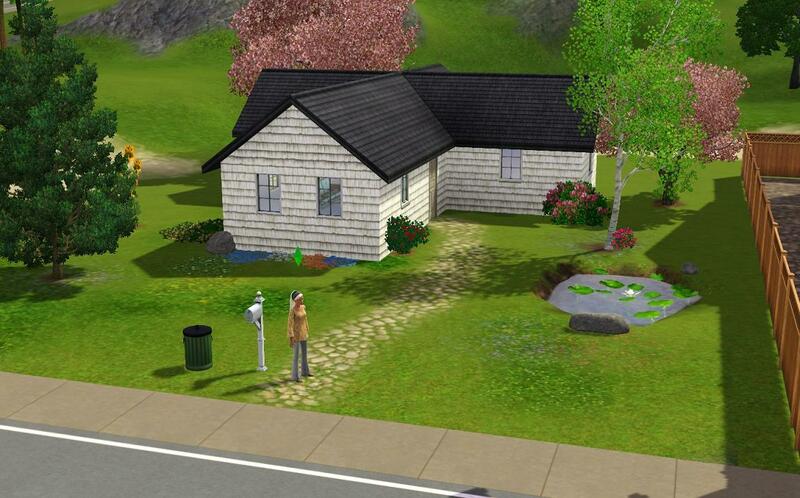 Herb’s driven lifestyle (and of course the marvellous ongoing saga of Alice & Kev) made me wonder if it would be possible to play a Sim who didn’t work but got by all the same — which led to the creation of Sunbeam Moonlight, seen standing here in front of the house she just inherited from her grandmother. Three guesses as to what she might be, and the first two don’t count. Hehe, Herb is great! Can’t wait to hear more about Sunbeam. My goal right now is to add interesting skin colors to my town. You can make red, blue, and green Sims, but there aren’t any townies with the exotic skin colors. Therefore, I’m doing my best to raise male blue Sims through selective breeding and then forcing them to impregnate as many female Sims as possible. It’s going well so far. My starting family is a blue pair of brother/sister Sims. The brother has five children (and one on the way) and four of them are blue! Sister, sadly, gave birth to two daughters, both of whom are the standard pinkish brown. I’m planning to either move one of Brother’s sons in with my family (mothers take full custody of children when the parents don’t live together) or just choosing one of the son’s households when he grows up and moving him into his own home to repeat the process. My hope is that I’ll start seeing blue Sims wandering around at random. Then I’ll get to work on green and red! Ah…eugenics. neat Ysharros 🙂 this really sounds cool. I was wondering how it handles day and night, does it make you watch the entire night go by or does it skip to highlights? There are 3 different basic speeds (normal, faster, fastest) and one “fast forward through current action” speed which then returns you to whatever speed you were at before — and the usual Pause mode, of course. But you make this game sound like lots of fun and I wouldn’t mind trying it, but I don’t want to end up with a bunch of suicidal Sims. 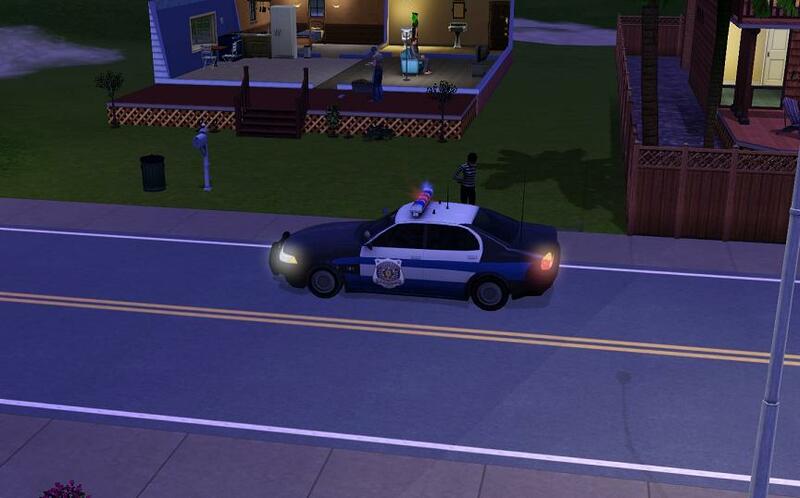 I’ve found it pretty easy to keep my Sims entertained, so far. From what I remember of my very brief previous stint with the game (waaay back at Sims 1), mood management is a lot better now. Getting a sim to work, now, is as easy as making sure they’re ready when the carpool comes, and you get an hour’s warning for that. Again — I don’t remember much from the previous time I played it, except that now it’s a lot more natural and intuitive. Yes, it’s a mood management game, but it’s not a huge struggle. 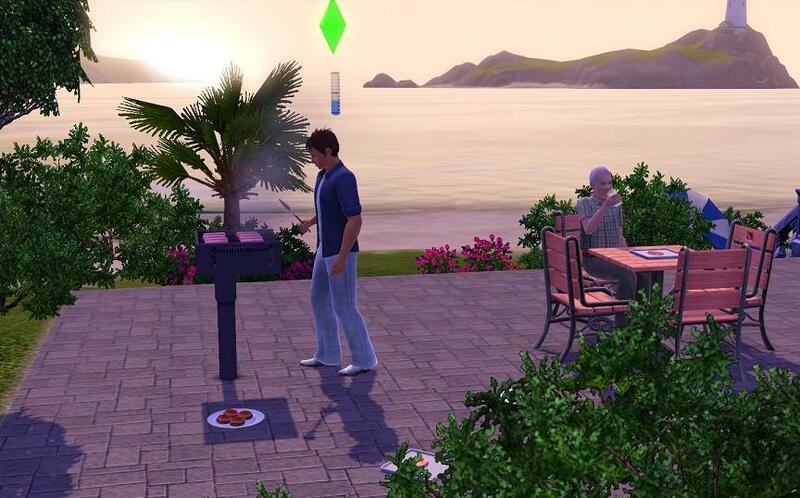 The Sims 3 (as well as a later expansion from The Sims 2) offers a reward system that lets you alleviate some of the mood management concerns. Basically, the more successful your Sim is in life — her wishes are satisfied, she does well at school/work, etc. — the more “points” you accrue. These points can then be used to purchase rewards. Some of the cheaper ones are a bit mundane — your Sim gets a discount on products she buys at the grocery store, your Sim has a fast metabolism — but you can also endow your Sim with a steel bladder, a dirt defiant body, and a hardly hungry stomach. With all three of these rewards purchased, my Sim only showers once every two days, uses the restroom once a day, and eats once a day. Each time that these things happen, I’m usually at a half-empty mood bar, meaning it wasn’t an emergency either. I’ve come close to missing work a bunch, my place is a mess half the time and I can’t seem to make it to places on time to finish “Quests”. Still, I spent 4 hours today just working up to my Sims first birthday. I managed to have a party and everyone enjoyed it. Course the strangest thing so far is the game wanted me to kiss a co worker. Not sure why, but oh well, when your a podium polisher, who cares, right? Oh and I made the mistake of making my Sim a Computer Whiz, so he spends too much time playing computer games and not enough time socializing….sounds like someone I know personally. Well, got to get back to some MMO action.